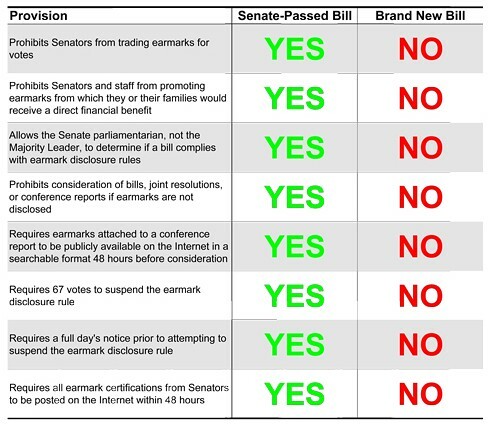 Senate Majority Leader Harry Reid has rewritten his signature ethics reform bill to strip it of meaningful earmark reform, a remarkable development for a Democrat who promised to clean up Washington. Text of the bill was released this morning and is available at the Porkbusters website. Senators Tom Coburn (R.-Okla.) and Jim DeMint (R.-S.C.) have promised a fight. The chart below was put together by Coburn’s office to show the extent of the changes. Meanwhile, DeMint’s office says the senator will offer an amendment with his earmark reform language, which was agreed to on a 98-0 vote in January. The concern is that Minority Leader Mitch McConnell (R.-Ky.), fearful of picking a fight over ethics reform, might cave in to Reid.